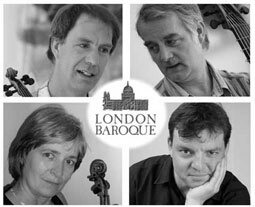 London Baroque continues to give vital and enriching performances with all the technical perfection and musical maturity their public has come to expect. They have performed in most of the major European festivals, appeared frequently on TV and radio the world over, and tour regularly in Japan and the USA. Their repertoire spans a period from the end of the sixteenth century up to Mozart and Haydn with works of virtually unknown composers next to familiar masterpieces of the baroque and early classical eras.